Mississauga, ON, April 26 2016 – healtHcentric, a division of ergoCentric Seating Systems, today introduced the Aloe Sleeper Club, the world’s best and easiest-to-use sleeper chair that lets users effortlessly open and close the chair. The launch of the Aloe Sleeper Club extends healtHcentric’s existing line of Aloe Sleeper, patient and guest seating and provides healthcare facilities with a sleeper chair that requires no instructions or staff assistance to operate and is easy to move allowing for efficient and thorough cleaning – benefits that are extremely important to healthcare staff. healtHcentric’s patent-pending Aloe Sleeper Chairs operate with an ingeniously simple mechanism driven by one stainless steel spring. In contrast to more complex designs, the simplicity and straight-forwardness of the mechanism’s design makes the Aloe Sleeper Chair less susceptible to interference, resulting in superior performance over time. Available in two styles – club arm or open frame – the Aloe Sleeper Chair series is available in a range of widths accommodating for the variance in available space between new and old healthcare facilities. 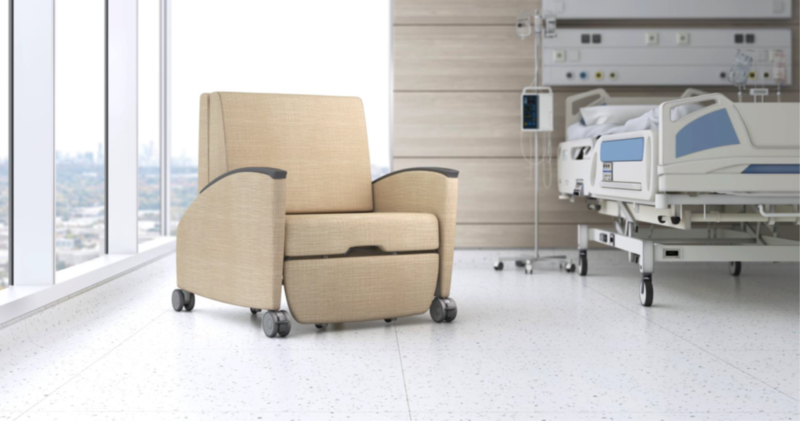 Intuitively glides back-and-forth from visitor/patient seating into a generous sleep surface in seconds. One stainless steel spring reduces the need for maintenance. All-metal frame assures maximum durability. Width ranges from 28” – 39” to accommodate most room sizes. Available with open frame features for superior cleanability and infection control. Optional club-style arms create a relaxing and warm atmosphere. Aloe Sleeper Chairs can be upholstered in IC+™ Upholstery Solution on the back, seat, and kick plate to offer the most durable, cleanable and impermeable medical-grade surface. Dual wheel casters for easy mobility with locking feature on all casters, to position in place (Club version only). Recessed pull handle positioned at the top for easy conversion back into a lounge chair.